For the Connectomics contest on Kaggle the task is to write a brain connectivity estimator using neuron activation time series data. Benchmark code for Discretization Pearson Correlation was available in C++ and Matlab. Now here in Python too! This article is under construction for the duration of the contest. The competition admins have released their own Python with correlation benchmark code. Check out their Github repo. Reconstruct the wiring between neurons from fluorescence imaging of neural activity. The contest admins have kindly provided benchmark sample code, a 5 minute tutorial, and references. 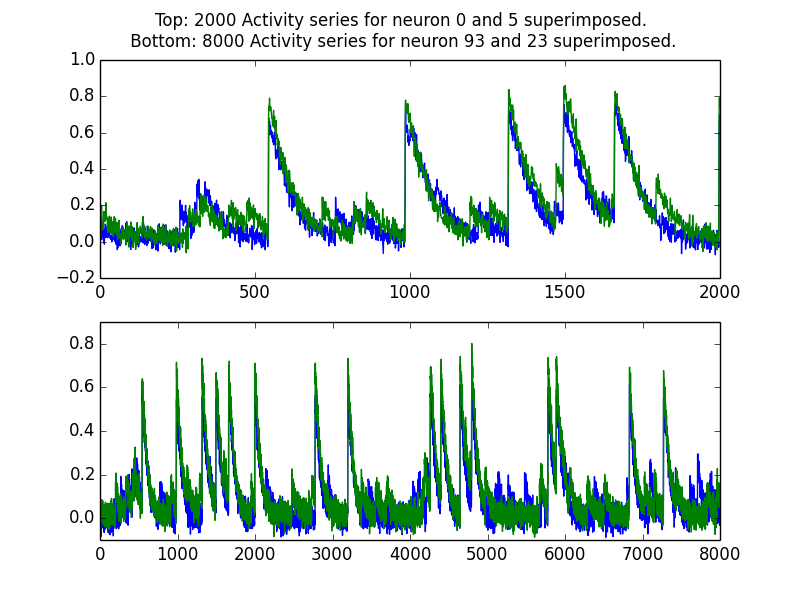 Basically you get a data set of 1,000 neuron activity time series and you are tasked to predict the connections between these neurons. This can be called a brain connectivity estimator. The neurons can be grown in vivo and the activity recorded with the help of fluorescence. Parsing the data is done with the functions in brainparse.py. All available data (Neuron activities, Neuron positions, Neuron connections) is stored in dictionaries. Use series_dict = bp.parse_time_series("c:\data\fluoride.txt") to create a time series dictionary from a file location. Use discrete_dict = bp.discretize_time_series(series_dict, threshold=0.12) to apply discretization to a time series dictionary with a threshold of 0.12. Discretization can be done by first applying numpy.diff to a series. The diff() of [0.1,0.5,0.4] is [0.4,0.1]. Then apply the threshold. If diff at n is larger than threshold=0.12 put 1 else 0. [0.4,0.1] with binary threshold applied is [1,0]. Use neuron_connections, blocked = bp.parse_neuron_connections("c:\neuralconnections.txt") to create a dictionary with the neuron_connections and an integer blocked holding the total of blocked (-1) connections. Neuron connections is a dictionary in the shape dict[(neuron_i, neuron_j)] = int connection. Int connection can either be -1 meaning blocked. 1 means a connection is present and 0 means no connection is present. Input a position file location, output a dictionary with dict[neuron_id] = (x,y) where x and y are scaled between 0 and 500 (from an original scale of 0,1000). This allows you to visually layout the network, check the cluster density or calculate (Euclidean) distance between individual neurons. You can find the Python Correlation Benchmark at GitHub (model.py). First it parses the data needed to make this model: A time series dictionary with discretization (threshold at 0.12), and a dictionary with the neuron positions. Then the matrix of neurons (100×100 or 1000×1000) is traversed. The correlation between two timeseries is calculated with scipy.stats.pearsonr. Pearson correlation for valid_5_100 or “the connection between neuron 5 and neuron 100 in the validation set” is the same as valid_100_5, so this benefits from caching using a cache dictionary. All code for this benchmark is available at Github. Run-time for a data set of 1000 neurons (1 million connection estimations) is about 5 hours and 52 minutes 38 minutes on a laptop. The script uses at most ~5.5GB less than 1GB of memory and give a public leaderboard score of ~0.87337 AUC. The parse script can also be used to create visualizations and animations. brainsimulator.py uses PyGame to animate a neural network of 100 neurons. ML Wave would like to thank Kaggle, its competitors and ChaLearn for this wonderful competition, tips on the forum and data sets. Thanks for the code. Maybe we can implement some more brainconnectom code based on your work ! Thanks so much for posting your code. Thank you so much for sharing the code. Really appreciate that.